Autumn is here and winter is right around the corner, which means you’ll be looking for warm hearty meals that keep you strong during the tough weather. This low carb, Keto Pot Roast recipe is perfect for anyone on the keto diet. It’s a savory and filling meal, perfect to prep ahead of time and enjoy through the week. It’s also incredibly healthy for you and will help to strengthen your body to better fight against disease and illness. This low carb, Keto Pot Roast recipe is an excellent deterrent against various diseases, but the most significant of those being cancer. The ingredients we’ve included in this roast have been found to help support the body’s defenses against cancer. Both grass-fed beef and grass-fed butter provides powerful anti-cancer properties. While grain-fed cattle can provide nutritional benefits, grass-fed cattle provide higher concentrations of many vital nutrients due to their healthier organic diet. For example, compared to standard grain-fed beef, grass-fed beef has higher amounts of conjugated linoleic acid (CLA), antioxidants, and vitamins that all aid in fighting cancer [*][*][*][*]. Let’s not forget about the vegetables included in this roast. Celery, turnips, rutabaga, and onions all have anti-cancer properties. Celery has compounds that not only help prevent cancer, such as polyacetylenes, but also contains apigenin, a flavonoid shown to help kill cancer cells [*][*]. Turnips and Rutabagas also contain powerful cancer-preventing compounds called glucosinolates. Studies have shown that these are powerful natural cancer-preventing nutrients [*][*][*][*]. One of the most common underlying causes of various diseases in inflammation in the body. That’s why it’s so important to incorporate foods into your diet that counteract and prevent inflammation. The ingredients in this roast does that and then some. Bone broth helps our bodies reduce inflammation in numerous ways. A few minerals it contains are chondroitin sulfate and glucosamine which have been shown to primarily reduce inflammation in the joints, as well as glycine, a powerful antioxidant. Additionally the gelatin in bone broth helps to heal and protect the lining of the gut (aka leaky gut syndrome) which in-turn helps reduce intestinal inflammation [*][*][*]. Grass-fed Butter can help to increase your butyric acid levels which have been shown to decrease inflammation and even help those suffering from Crohn’s disease [*]. Celery also contains antioxidants such as phenolic acids and quercetin that aid in anti-inflammatory results throughout the body [*]. 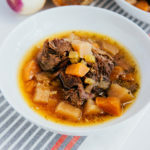 In addition to healing your body from debilitating diseases and harmful inflammation, the ingredients in this low carb pot roast will also help boost your immunity, which is crucial heading into peak cold and flu season. Both Turnips and Rutabagas contain high amounts of vitamin C which is crucial to boosting your immunity and preventing illness. By supplementing your diet with healthy levels of vitamin C your body can effectively produce white blood cells essential to fighting bacteria and disease [*]. So gather these ingredients together, toss them into your slow cooker, Instant Pot, or other pressure cooker and let these incredible ingredients blend together into a perfect meal for autumn weather. This low carb pot roast It will not only warm your soul but also strengthen your body. Add everything to a slow cooker on low for 8 hours. Place roast and all other ingredients to the Instant Pot or pressure cooker. Close the lid and make sure the pressure release is sealed and not on venting. Set timer for 80 minutes on high pressure. Allow pressure to naturally disperse for 20 minutes, then set the pressure release to venting. Once pressure has been release, serve as the main dish with a side of cauliflower mash and enjoy.